Ataturk desired to make horseracing, traditionally a sport reserved for kings, accessible to common Turks. At the Veliefendi Hippodrome on Istanbul's European side, that vision is being realized, one race at a time. A stretch of wide-open, pastoral beauty in an otherwise dense, industrial district of southwest Istanbul, the Veliefendi Hippodrome is the cynosure of horseracing in Turkey. Through the gates, in a scene that would not be out of place in Kentucky horse country, flowering corridors and tree-lined paths lead to grandstands overlooking a grassy infield, plus tracks of synthetic dirt and plush turf. Along the far edge, a labyrinth of barns stables 1,200 thoroughbred and Arabian racehorses. Just outside of the complex, new apartments are creasing the sky, as if vying for a prime spot to watch the next contest. Infrastructure, jockeys, horses, a growing fan base, the pieces seem to be all in place for horseracing to become a big deal in this country. But what will it take for Turkey to become a major player in international equestrianism? That question is what drives the Jockey Club of Turkey (TJK). Since 1950 the club has sought to turn the sport into a national industry. Headquartered on the grounds at Veliefendi, the TJK supervises racing venues, breeding farms, wagering outlets, and televised broadcasts. Last year alone, the club brought in $1.5 billion. As momentum builds, especially through online betting, the goal is no longer mere profitability but for preeminence in the world of high stakes horseracing. The TJK’s efforts are beginning to pay off. In 2009, the International Cataloguing Standards Committee — the group that governs international horseracing — upgraded Turkey from the third tier of horseracing nations to the second. Mustafa Akay, a manager at Veliefendi who interfaces internationally on behalf of the TJK, says that he was pleased by the decision but adds that he won’t be satisfied until Turkey reaches the top tier, alongside nations like the United States, Japan, United Arab Emirates, and England. Veliefendi is the theater where this narrative is playing out. Races occur every Wednesday and Friday evening, every Sunday afternoon. The track is home to the $500,000 Gazi Derby, Turkey’s equivalent of the Triple Crown, all rolled in to one race. In September, a two-day international competition where local owners and jockeys challenge athletes from Europe and abroad takes place at Veliefendi. Mustafa Akay says plans are even in the works to host one of the 2012 Kentucky Derby prep races. Race day at the Veliefendi Hippodrome. Horse trainer Vedat Boyraz, 30, who first came to the track as a jockey candidate at age 12, has literally grown up at Veliefendi. He followed his older brother there from Sivas, a rural province in east-central Turkey, 400 miles away. There he was apprenticed under the tutelage of the TJK for two years, earning his license to ride. Within two more, he was flying around the track, prepping horses well before sunrise. But there was a problem: Vedat was growing too fast. Five years ago, Vedat moved to Australia to hone his skills as a thoroughbred trainer. Upon returning home, he landed a job with Serdal Adalı, one of Turkey’s most influential and highly visible racehorse owners. Out of the 170 horses Adalı owns, Vedat now works with the 27 stabled at Veliefendi. Adalı, who runs a construction company with projects across the Middle East, has made horseracing a hobby. As a leader of the Beşiktaş Sports Club of Istanbul, he also knows what it takes to win and has the pockets to make it happen. 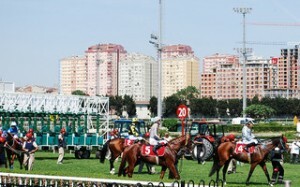 Despite the rising fortunes of the Jockey Club of Turkey, and the groundswell of popular support for horseracing, Mustafa Akay is keenly aware that Turkey’s grand ambitions for thoroughbred sport ultimately will not be realized through the betting window or in the number of highly skilled jockeys Viliefendi produces. Rather, Turkey’s racing future is dependent, in large part, on horses. Equestrianism is about ancestry, heritage, and pedigree. This sport of kings typically crowns only the purest of bloodlines. Although passing down prize-winning genes is no sure bet for the breeder, the odds are in his favor if he can get a big-name stallion for his mare. Similarly, as long as Turkey’s barns are stocked with the best studs, the nation’s racing industry will make steady strides toward ensuring the next generation of fleet-footed colts. Reaping the benefits of a booming betting market, the TJK is reinvesting assets in high-quality studs. Frequenting famous auctions in Kentucky and Ireland, Turkey has begun importing top-dollar European and American stallions and offering them to local horseracing aficionados at discount rates. Last year, the Jockey Club made a blockbuster deal in the sporting world, acquiring five powerhouse thoroughbreds to add to its stud farm in Izmit, just east of Istanbul. Among them were Kentucky Derby runner-up Lion Heart, and Dehere, grandson to the legendary Secretariat. Dehere has sired three big-money racehorses in Australia, and many other American winners. Already the Jockey Club is seeing the payout on its business venture, not only regionally, but also as prospective breeders flock into Turkey from South Africa and Asia. The more expensive the horse, the more pressure to perform. As the ante for horses rises in Turkey, so too does the anticipation, the expectation to win. 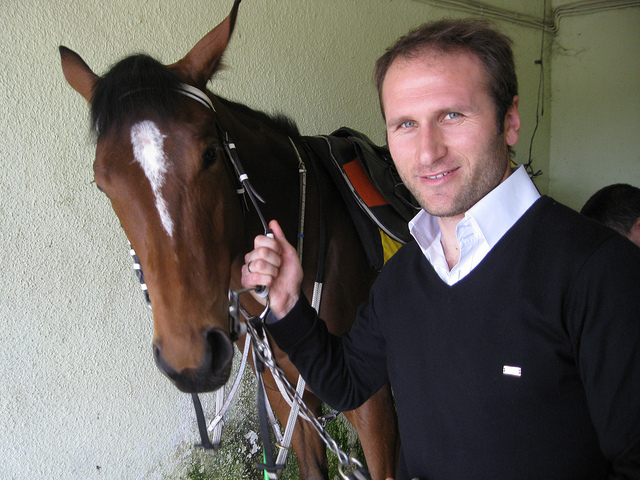 In Australia, Vedat worked almost exclusively with a single horse, Murtijill. At one point, the horse was valued at nearly $30 million. Vedat still remembers the intense emotions, the excitement and the edginess, he felt during the Golden Slipper race at Rosehill in Sydney. His prize thoroughbred ran hard and strong until the last 100 meters. In a snap, Murtijill dropped back to fourth, and dropped in value by more than $20 million. Those same emotions still flood Vedat today, on an otherwise insignificant afternoon at Veliefendi, when his horse Quaresma takes on a herd of 3-year-old English breeds on the turf. It all begins with the long, deliberate walk from the stable to the warm-up track tucked behind the jockey’s quarters. No less than 45 minutes before the race, the horses have started their routine. Some become instantly excited, kicking whatever they can. Once corralled by a team of handlers, they’re escorted to confined space. Others strut and snort, flexing sinew and foaming at the mouth. Like boxers jawing at one another before entering the ring, they each have something to prove. Meanwhile, just inside, jockeys dress in the locker room. The south side of the building is a solid sheet of glass, a display window for race day shoppers. Jockeys line up, not yet fully dressed, and step onto a scale. The green digital screen instantly flashes their weight along with the saddle and boots they juggle in each hand. Roughly ten minutes before the bugle call to the post and the start of the contest, horses are clad with race numbers and featherweight saddles, and begin to file their way to the oval paddock. Handlers then parade the show in front of eager onlookers who scour the daily racing guide under a canopy of horse chestnut trees. In the center of it all, trainers update nervous owners. Jockeys, now sporting colorful regalia, enter the ring and receive last-minute instructions. Vedat’s brother Sadettin mounts Quaresma. A bell rings. With a hoist, the anxious jockeys mount. For Vedat, the time of uncertainty, and of real emotion, begins. Thoroughbred racing creates abnormal combinations. Fear and exhilaration. Affluent owners and dusty grooms. Calculated risk and all-out luck. But the most precarious tandem remains the most basic: a half-ton of horse with a 115-pound rider on its back. Anything can happen once the pair emerges onto the track. Raucous crowds and strange surroundings can spook an inexperienced colt or philly. At the starting gate, stallions may act more like stubborn mules, dig in, and refuse to move. Too much excitement too early, and the horse has nothing left for the race. Standing back from the crowds that swarm the finish line, Vedat sighs deeply, once, then twice. He can’t harness his nerves. Then, they’re off. In unison, the thoroughbreds lunge forward. Within seconds they are at full gallop and out of sight along the backstretch. Thousands of necks instantly jerk toward the jumbo screen on the infield. Crumpled racing guides, now raised like imaginary whips, urge on favored picks. Uneasy onlookers shout out random names and numbers. Two minutes flash by like two seconds, and the roll of distant thundering hooves is heard rounding the bend, heading for the finish. “We’re in a good spot,” Vedat whispers, even though Quaresma is in the middle of the pack. The final seconds down the stretch last an eternity. Too late, Quaresma makes a charge. The horse finishes third. Vedat exhales his frustration. The reality that Vedat faces, is, on a smaller scale, the same as Turkey’s in its effort to become an equestrian powerhouse. At the end of the day, to make it in horseracing, you have to win races. Vedat hates losing. He works, he lives to win. Brian McKanna is a contributing writer to EthnoTraveler.